The best solution for the viaduct is a two-way boulevard. End of story. Posted by dan bertolet on	Wednesday, December 31st, 2008 at 12:02 am. You can follow any responses to this entry through the RSS 2.0 feed. You can leave a response, or trackback from your own site. Property developers, too, should be keen to see a waterfront boulevard. Heavy traffic is rarely not noisy, but the moderate speeds and the relative absence of (sound-reflecting) architectural enclosure along the west side of an Alaskan Way boulevard would be significant mitigating factors. The east side would be prime urban real estate. The most successful of these boulevards have an equal width dedicated to pedestrians/bikes as cars. Is that possible in the total width available under the viaduct and on Alaskan? 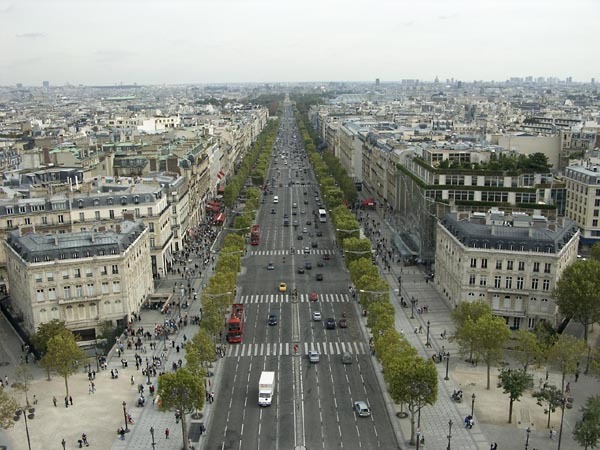 The pedestrian total width could be contiguous, like the Champs Elysees, or broken up with grade-separated bike lanes. Danb, I’m surprised at your desire for a boulevard such as these. I am in middle of “The City in History” and he just finished talking about the boulevard basically as a baroque pronouncement of power. It was never meant to facilitate the pedestrian, but rather to speed up VEHICLE traffic and host military parades. Yes, perhaps Paris has been able to transform the Champs Elysees into an attraction but I would say this is the exception not the rule. Think about Market Street in San Francisco or Queens Boulevard in New York. Even the Grand Boulevards you talk about in Barcelona aren’t particularly pedestrian friendly and for the most part are residential only. 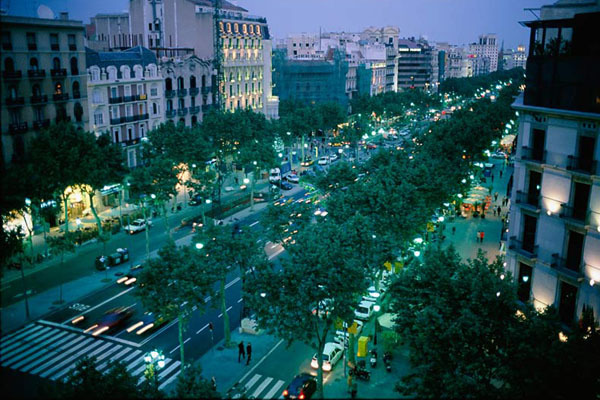 The places with the most activity in the city are the OLD CITY with its narrow streets and LAS RAMBLAS which is a PEDESTRIAN boulevard, something infeasible on the waterfront if six lanes are necessary. Boulevards are simply not pedestrian scale. Period. Perhaps the couplet isn’t the best but I just don’t see a six-lane boulevard doing anything transformational for the waterfront. My preferred solution would simply be a minimum of vehicle capacity requirements. I think then we could talk about a boulevard pedestrian-style. But I just don’t see that happening. A boulevard is itself a compromise. What we need is a street–the street we already have there, with two lanes in each direction–and broad sidewalks on the eastern side, with street parking as a pedestrian buffer. The ideal design would put new development right up to those broad sidewalks, but it’s a pretty narrow corridor compared to other nearby blocks such as what’s already on Western. There’s enough room that a streetcar and bicycle lane could be added instead of new development. Leave enough of a surface area as a park so that it could be used as a future staging area when building a tunnel if it becomes necessary. I should have been more clear that I wasn’t suggesting that something as massive as the Champs Elysees belongs on the Seattle waterfront. Something more like Octavia Blvd, perhaps with the access lane and parking only on the east side. It requires careful design for the given context, but I think it could be done successfully. I’d suggest that a boulevard is not a boulevard is not a boulevard. Market St. in SF is really very pedestrian-friendly. The problems there as I see it come from the poly-street intersections and pedestrian signaling, but are minor. 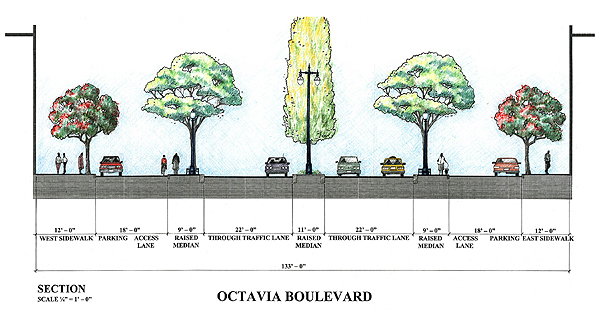 Octavia Blvd, as pictured above, has proven less-successful than its boosters had us believe. It’s a boulevard for cars, and pedestrian space is broken up. The signaling at the intersections, however, is well above average. Seems incoherent to me to reject an urban form – in this case, the boulevard – on the basis that it constitutes a blatant expression of political or economic power. If this were our criterion, we’d have to reject the very notion of a modern city. I doubt Seattle’s city planners would envisage anything resembling the Avenida 9 de Julio in Buenos Aires or the Avenue des Champs-Elysees in Paris. Space and means don’t permit. But the oft-noted absence of an urban ‘center of gravity’ in Seattle does certainly point to the lack of a monumentally-dimensioned avenue or central square. Personally, I would be delighted to see a waterfront boulevard of representational character, even if it were a bit tedious for pedestrians to cross. A propos pedestrians : can we fairly expect them to flock to the cool, damp and windy grey stretch of seawall interspersed with piers that is the Seattle waterfront? I suspect many among us are guilty of romanticising it in our urbanistic imagination. We think the Seattle waterfront would be great if only its sidewalks were handsomely decorated. Yet pedestrians, time and again have shown us they prefer places that are warm and dry. I think a compromise for the stalwarts in W Seattle is a bridge from Alki to Magnolia. It would be majestic and they’d be able to bypass Seattle completely. ack! This new blvd. looks like a compromise. six lanes, yikes! If nearly the same volume of traffic moves along that blvd. as did on the viaduct the waterfront hasn’t worked out its problem. That’s a lot of exhaust that has now moved down to the pedestrian level. Did anyone ever propose an option that developers built as they excuvated for new building foundations? With some fancy engineering couldn’t through town vehicles expressed under ground? Not that I like to argue for this proposal, but has anyone ever traveled down 2nd avenue in downtown Seattle? It’s by far the fastest way to get from the north end of downtown to the south end…even by bicycle. Spencer – Shhh, don’t let the secret out! Unfortunately the converse isn’t true. 4th avenue is often very slow, especially between University and Virginia. Anything else is just an excuse for the reality that we spend too little on infrastructure and too much upon the military and the various wars including the criminal mercantilism protectionism of the ‘drug war’. Cascadian @2 is right on. Throughput for cars should be very low on our list of priorities. In the not too distant future we will driving a lot less, whether we like it or not. We should be spending every penny of our limited funds on infrastructure that supports travel by foot and transit. This is the reality of a future with climate change and peak oil. A guaranteed ten minute car ride from West Seattle to Ballard is nowhere near top priority any more. You and Cascadian are correct. The plan needs to have enough vision to project what the future will be more like. I suspect our nearer future is not less cars but less gas powered cars. Most solutions to our personal transportation problems point toward hybrid and alt/fuel vehicles. It seems until the auto industry and the Fed.s start talking about funding mass transit we have to live in a world where wide streets pave the way. This means we must have some forethought and better vision for this solution. What I’ve seen so far is putting stitches on a problem that needs surgery and rehabilitation. I see the city and state’s policies as reactive at best which and why (historically) private and non-profit organizations have instigated change (both good and bad) in Seattle. We should demand an integrated solution that drives into the future of our city. It should show how this street will change and force change on the way we travel and inhabit our city. It’s a chance for our city to be bold and inventive rather than passive and short sighted. Glad I found this tidbit on yahoo when I was surfing the web. Good STUFF! I like this taste much, this is the precondition where i can maxim smth from me, a attitude of low-down this is what i like.